Since Footwear, Gaiters, footwear parts, gaiters parts industries fall under agriculture sectors and standard commodities, the GST tax is expected to be charged at minimum level. Footwear, Gaiters, footwear parts and gaiters parts falls under HSN code chapter 64 of GST commodity tariff schedule. The details about GST rate changes for sale of sale of Footwear, Gaiters, footwear parts, gaiters parts are being updated here. 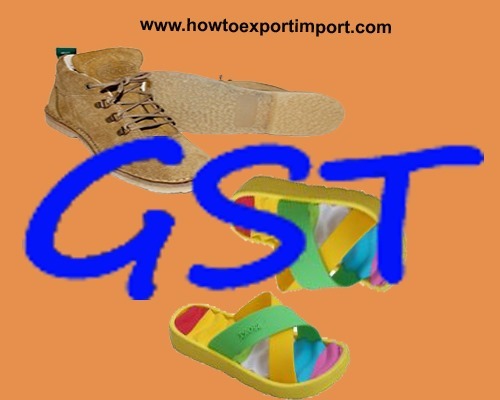 The notification changes on exemptions for GST for sale of sale of Footwear, Gaiters, footwear parts, gaiters parts and other circulars related to GST for Footwear, Gaiters, footwear parts, gaiters parts are updated in this website. 1. Footwear having a retail sale price not exceeding Rs.500 per pair, provided that such retail sale price is indelibly marked or embossed on the footwear itself. 1. 6401 Waterproof footwear with outer soles and uppers of rubber or of plastics, the uppers of which are neither fixed to the sole nor assembled by stitching, riveting, nailing, screwing, plugging or similar processes. 2. 6402 Other footwear with outer soles and uppers of rubber or plastics. 3. 6403 Footwear with outer soles of rubber, plastics, leather or composition leather and uppers of leather. 4. 6404 Footwear with outer soles of rubber, plastics, leather or composition leather and uppers of textile materials. 6. 6406 Parts of footwear (including uppers whether or not attached to soles other than outer soles); removable in-soles, heel cushions and similar articles; gaiters, leggings and similar articles, and parts thereof. 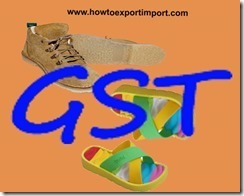 In India, GST is payable for Footwear, Gaiters, footwear parts, gaiters parts. However, some of the categories of business under HSN code 64 are expected to be exempted from paying GST. The list of exempted categories of business and exempted products and services under GST is expected to be released soon. UTGST Act, Constitution of Authority for Advance Ruling. How much GST on outer Soles and Uppers of Plastics Other Sports Footwear?